Das U-Blog by Prashanth: Review: Chakra 2015.11 "Fermi"
Not only has it been a while since I've done a Linux distribution review on this blog, but it has been an especially long time (over 2.5 years, in fact) since I've looked at Chakra. I figured that now that KDE 5 (technically incorrect terminology, I know, but please bear with me, as I'm using this for the sake of brevity) is being used in Chakra, it may be time to see how a distribution I've rather liked in the past has evolved. In case you don't remember, Chakra was originally based on Arch Linux, but a few years ago, it branched off into its own independent distribution with its own repositories, though certain tools (like the package manager Pacman) are based on things found in Arch Linux. 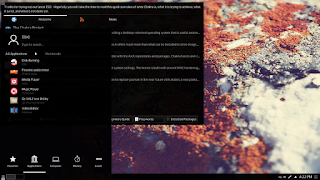 It focuses exclusively on KDE, and it uses a semi-rolling release model in which core system packages are updated less frequently in order to maintain stability, while front-end applications seen by users most often are updated more frequently to provide a competitive desktop experience. I tried this on a live USB using the "dd" command; as in my review from over 2.5 years ago, neither UnetBootin nor MultiSystem work anymore for reliably creating Chakra live USB media. This wasn't a terribly difficult thing to do, but in any case, the Chakra wiki contains a little more information for people who might need a little more help with these steps (especially if they are new users from Microsoft Windows who are trying a Linux distribution for the first time). Additionally, note that Chakra can only be used on 64-bit computers. Follow the jump to see what it's like. Using the command "dd" preserves the boot sequence that would be seen on a live CD/DVD, so I was greeted with a slightly stretched and blurry welcome screen followed by a reasonably simple boot menu with some other options on the bottom. I went with the default selection, and in less than 5 seconds, I was taken to the desktop splash screen, containing the time and date along with a spinning icon that quickly gave way to the desktop. The desktop is fairly standard for KDE, though of course everything looks a bit more flat and polished with KDE 5. 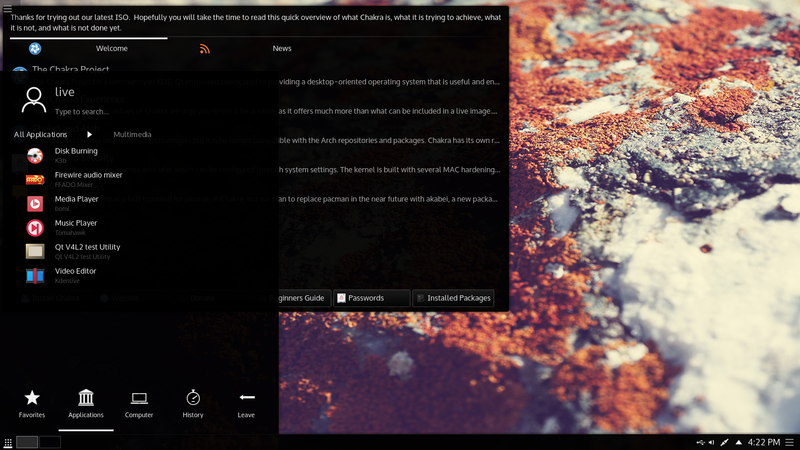 Additionally, the Chakra developers have gone hog-wild with the black theme; while this does look slick, it occasionally causes problems when different parts of the desktop overlap with windows (like the terminal) that have black backgrounds, as the borders between these different things become harder to distinguish. Relatedly, perhaps what I'm about to say is because I've been using my main Linux Mint system for so long without trying another distribution, but I found the desktop to be a little finicky, in that mouse gestures and things of that nature happened a bit too quickly for my tastes. These are all things that can be modified with relative ease, but they may be turn-offs for new users. Also, I wish the Chakra developers would use a more distinctive icon for the Kickoff menu in the Plasma panel; it wasn't until I clicked on it that I realized it wasn't some alternative pager or activity switching widget. That said, one nice thing about the desktop is the appearance of a fairly detailed interactive Plasma widget on the desktop that provides information about the distribution, information about passwords in the live session (which helped me later on), and things of that nature. Overall, I think the desktop looks a little too slick for its own good, to the point where certain key aspects of usability have been sacrificed for the sake of appearance (though these aren't dealbreaking issues for me). QupZilla is the default browser due to its use of Qt by default. It was originally based in part on Mozilla Firefox, and that heritage is very visible here, but that led to a few minor problems for me when combined with the finicky nature of actions in the distribution itself; mainly, I feel like QupZilla exhibits an uncanny valley effect, because it looks so similar to Mozilla Firefox, but it can't use the same extensions, and customization options are put in places that I find weird (given my longtime use of Mozilla Firefox). Anyway, the browser itself worked fine overall, I was able to watch YouTube just fine using the HTML5 option, but Hulu and other sites required the installation of Adobe Flash. To do this, I had to use the Octopi package manager, which is a nice GUI front-end for Pacman. It took a few times to properly sync the package databases, but once that was done, I was able to install and use Adobe Flash just fine. However, this led to a big problem. Pacman wouldn't run after that, because Octopi runs "pacman -Syy" to update and sync the package databases, and this gave the error "pacman: error while loadign shared libraries: libnettle.so.4: cannot open shared object file: No such file or directory". Looking online for help with regard to this issue in Chakra only turned up one result that said this isn't a bug, which is certainly not helpful at all. All of the other results seemed rather dated and geared toward Arch Linux, so I decided not to pursue the matter further. Chakra used about 800 MB of RAM at idle, which is fairly hefty. Additionally, it did support desktop effects, but I couldn't find certain ones like the desktop cube because they weren't installed by default. I would have liked to try installing that too, but that was also precluded by the issue with Pacman. Overall, the nonworking nature of Pacman after a single package installation routine is a dealbreaker for me, so I cannot recommend Chakra 2015.11 "Fermi". Sure, the usual caveats apply that the live session may not accurately reflect the behavior of the installed session, but then I should wonder what the live session is good for, and I wouldn't want to take a chance by blindly installing a new distribution on my main computer. It certainly isn't good for newbies, though perhaps more experienced users might be able to properly diagnose and fix the issues I was experiencing. You can get it here, though again, I wouldn't recommend it unless you thoroughly know what you're doing. The developers did warn that there may be bugs and that Pacman would eventually be replaced by Akabei, a package manager built for Chakra, so perhaps what I experienced was in line with those warnings.